AGRI-FOOD INDUSTRY, HEALTH, PHARMACY AND COSMETICS. Our robots handle your products gently at a very high rate and manage the unforeseen on your production lines! We are innovating for the agri-food, pharmaceutical and cosmetic industries. Your products are fresh, fragile, living and frozen, etc. Our “Robotics and Vision” technologies manage them gently and quickly. 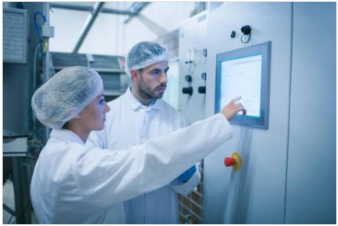 The Siléane Pick & Place or bin picking solutions intended for the agri-food industry, the pharmaceutical and cosmetics industries are simple, reliable, hygienic and applied by dozens of outstanding references in France and Europe for more than 15 years. Boxing: Putting in blister packaging, making up sweet boxes, etc. Boxing, packaging: Regular slotted cartons, flatbed cutting, etc. 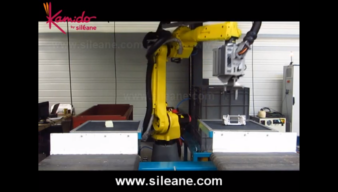 Siléane has many example of success: filling boxes of dates with a set weight, crates of bananas, trays of confectionery or pastries (mixing), making apple tarts with a set weight, calibrated and correctly covered, packing cosmetic and pharmaceutical products, transforming a heterogeneous production flow into homogeneous sales units. Our solutions control and handle with great flexibility, due to robots that are able to readapt their trajectories in real time and handle products at a very high rate. “Traditional” robots reproduce a pre-learned or programmed gesture. But how do you create (and not copy) a spontaneous gesture in real time and random context without learning? For example, separate bananas singly from a bunch without damaging their neighbours although their shape and configurations are changing all the time. A real challenge! The Siléane 3D gesture throws open the doors to more complex operations on these famous products “with variable geometry”. For cutting, decorating, forming, packing and handling, the 3D gesture enables our robots to understand all the subtleties of a 3D space in real time and adapt their trajectories automatically. In short, they like the unexpected.